With the release ceremony for the final 2009 Abraham Lincoln Bicentennial Cent scheduled for next week, the US Mint has also announced plans for two additional exchange opportunities for those wanting to get their hands on some of the new 2009 Lincoln DC Presidency Cents. The ceremony itself is scheduled for 10 AM ET on Thursday, Nov. 12, at the Ulysses S. Grant Memorial on the west side of the US Capitol in Washington, D.C. Following the program, which is expected to last around 30 minutes, attendees will be given the opportunity to exchange cash for new bank-wrapped rolls of the Presidency cents. Also at 10 AM, two other sites in D.C. will offer coin exchanges. The first will be at the US Mint’s sales outlet at Union Station, 50 Massachusetts Ave N.E. The second will take place on the first floor of the US Mint’s headquarters, 801 Ninth Ave N.W. All three locations will allow the exchange of cash for a minimum of two rolls up to a maximum of six rolls of the newly minted Lincoln cents. 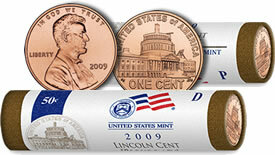 Each roll will contain 50 circulation quality coins struck at the Mint’s facility in Philadelphia. The Mint has stated in advance that the limits may be changed at any time. Each exchange location will run while supplies last, or in the case of the two Mint sales outlets, until 4PM (closing time), whichever occurs first. The Mint will also start offering the new cents for purchase via their website and phone ordering system on Nov. 12. Interested individuals will be able to order two-roll sets of the new pennies for $8.95, plus the handling fee. One roll will be 50 coins from the Mint in Philadelphia and one roll will be 50 coins from the Mint in Denver. The design on the reverse of the D.C. Presidency penny features an unfinished United States Capitol dome, as it would have appeared when Lincoln first took office as President. It was designed by U.S. Mint Artistic Infusion Program Master Designer Susan Gamble and was sculpted by U.S. Mint Sculptor Joseph F. Menna. The obverse contains a version of Victor D. Brenner’s Abraham Lincoln portrait that has been used on Lincoln cents since they were first issued in 1909. The previous Professional Life cent launch occurred on the grounds of the Old State Capitol Building in Springfield, Illinois on Aug. 13. Some 3,000 people were in attendance. 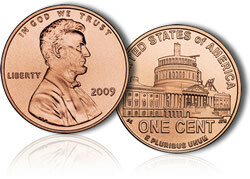 Since the final Lincoln penny launch is located in a major urban area — unlike the prior 2009 Lincoln cent releases — attendance could easily break the 3,000 level.